Some time ago i expressed surprise that while of the "28 leading scientists" the BBC claimed to have supporting catastrophic warming, only 2 were scientists, 7 were primarily or wholly concerned with foreign "aid" rather than even being "environmental" activists. I think I have the answer to that. As you will see from the list there were also 2 from the International Broadcasting Trust who "co-organised" this with the BBC. IBT were the ones who were stupid enough to leave the "cannot ever be made public because of journalistic ethics" list on their website. * Blake Lee-Harwood, Head of Campaigns, Greenpeace - has more than twenty years experience of developing and implementing advocacy and campaign programmes around the world on a wide range of issues. IBT - Cheryl Campbell, Executive Director, Television for the Environment - Cheryl trained as a journalist ...working for BBC ..Christian Aid...Cheryl is a trustee of the International Broadcasting Trust - no mention of studying to become a "leading scientist". * Tessa Tennant, Chair, AsRia - Association for Sustainable Investment in Asia - In 1988 she co-founded the UK's first sustainable investment unit trust ..served on environmental advisory panels for the UK Government and HRH The Prince of Wales IBT's site explains they are: "The International Broadcasting Trust is an educational and media charity working to promote high quality broadcast and online coverage of the developing world. Our aim is to further awareness and understanding of the lives of the majority of the world´s people – and the issues which affect them. We are a membership based organisation. We organise briefings for our members so that they can work more closely with broadcasters and producers. For a current membership list see IBT members page"
Their list of members is essentially a list of charities, a number of which I recognise straight off as government funded (UK and international) sock puppets. It includes Tearfund, who provided 2 of these 28 and Comic Relief which is essentially a BBC organisation - thus the BBC paying an organistation to lobby the BBC that it is right of them to censor. They don't say exactly how the funding works out but clearly they are not puttin g out the begging bowl and i am certain the taxpayer ultimately pays. Looking at the description of what it was founded for, the IBT was originally a lobbyist for the foreign "aid" industry. Looking at their list of productions it is also clear that this is how they started though latterly have moved into the "catastrophic warming" lobby industry. In the same way the American NCSE started as an anti-creationist "charity" moving into warmism despite their boss being unable to talk on the subject becase "she isn't a climate expert". Clearly what happened is simply that the BBC asked their "co-organisers" to do the organising and they just ran through their address book to include anybody who could be relied on to support the BBC line - not just not requiring that they be scientists but not requiring that they know anything about even warming alarmism. Meanwhile Brian Monteith has an article about the BBC, "BBC's bias is a big turn off" including discussion of 28gate. My most recent letter hasn't been publiched by the MSM either. As I reported yesterday I was in the Glasgow City Chambers on Wednesday which brings up this comparison. 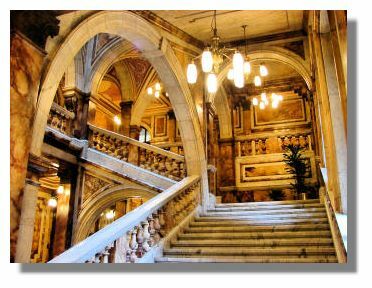 Inside it is a magnificently opulent building clearly designed to show the Victorian grandees confidence in Glasgow as the "2nd city of the Empire". On 6 October, 1883, 600,000 spectators watched a trades march of skilled workers from the city’s heavy industries and a civic-masonic procession converged in George Square for the laying of the foundation stone by the Lord Provost. Four years later, the topmost stone, the apex of the central tower – was laid and on 22 August, 1888, Queen Victoria performed the inauguration ceremony. The design of the pediment – the ornate, triangular gable crowing the front of the main building – was changed in 1897 to celebrate the Queen’s Diamond Jubilee. Original proposals illustrated the Clyde and the city’s manufacturing going to all parts of the world. The design was changed to show Queen Victoria enthroned and surrounded by figures of Scotland, Ireland and Wales “receiving homage and congratulations of her subjects from all parts of the world.” Above the pediment are representations of Truth, Riches and Honour. .. 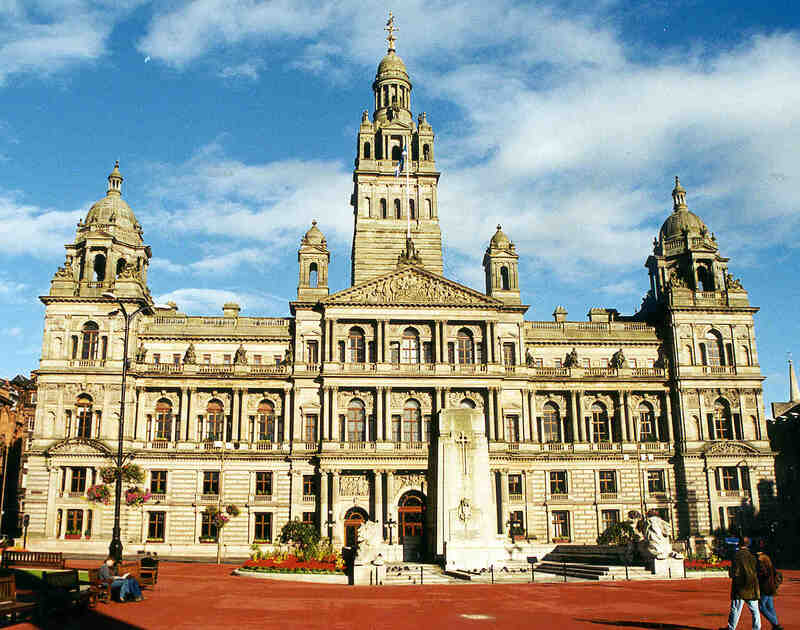 The City Chambers building cost £552,028. Including furnishings, the whole project cost £578,232. The original building covered 5016 square metres. With extensions, now 14,000 square metres. That makes it half the size of the 31,000 square metre Scottish Parliament which cost £414 million (official cost not including landscaping & some other stuff). £48 million as against half of over £414 million. And this comparison is valid because Glasgow's bloated capitalists, who also provided us with water supplies and a subway, were deliberately trying to push the boat out to celebrate their city. Nor did our social democrat leaders today demonstrate involve the people in Holyrood building with anything so proletarian as the "trades march of skilled workers from the City's heavy industries". Instead the heavy industries are gone, except for buying in foreign windmills and erecting them. And I am willing to bet money that the City Chambers will remain more impressive in another century. Mike Scott-Hatward of UKIP was one of 4 invited speakers last night (us & the LabConDems) to the West of Scotland Parliamentary Debating Society(WOSPDS) to speak against independence against 4 from the Yes campaign. Some years ago my father was a member of the Glasgow PDS which met in the same place & is probably the same organisation so I went along to support our speaker, from the audience, who I thought was likely to get and give some friendly fire. Nope - the LabConDem, speakers, including an MSP & a councillor, had pulled out on a few hour's notice. I don't know if this was in any way because they would face UKIP or simply because they are useless but you just don't do that. Showbiz celebreties say "the show must go on" and will do so with anything short of a badly broken leg. Professionals, of any sort, simply don't behave like that. So at a few minutes notice Stuart Maskell & I found ourselves drafted in (WOSPDS provided the other speaker). I joted down a few subject headings and prepared for a car crash. We made the running, we made the points and the Yes campaign didn't even attempt to answer most of them. Indeed a couple of them said that UKIP had "hijacked" the debate by bringing up arguments that the conventional No campaign simply don't do! Mike gave the best speech. He described UKIP's position as wanting a referendum as a matter of principle because our party is committed to a general right of popular referendums (as Switzerland, California etc, have). This got even the opposing speakers nodding in agreement. He explained how small and powerless an "independent in the EU" Scotland would be. I do not think I am being immodest in saying mine was the 2nd best. Considering that the last time I spoke in a debate was 7 years ago at a LibDem conference, with a prepared speech for 2 minutes and this was 8. I was relieved and pleased. The SNP's commitment to "independence in Europe", which isn't independence at all, shows how scared of the real thing they are. They are doing everything to make independence seem like less of a change. I was unusual, but not unique, in UKIP in that I could see circumstances where I would support separation - if the Westminster government were abysmal and Holyrood significantly better - and that actually Westminster IS abysmal but the Holyrood politicians are worse. I said the SNP economic policy of selling our windmill electricity to England at 3 times the going rate when we have some and buying it back at commercial rates when there is no wind is unlikely to be supported by an independent England that can buy commercially from France. That the SNP are clearly eager to join the EU on any terms - opposers raised as a point of order that they weren't and I said I would leave it up to the audience to judge. This means they would be stuck with an official duty to join the Euro, an end to the UK negotiated opt outs and joining Shengen on immigration which in turn means customs posts at Berwick. Finally I told of the BBC TV debate where I had taken issue with Patrick Harvies assertion that we should not expect any growth at all over the next 10 years if we go for separation though the rest of the world is growing at 6%. Opposers shook their heads but that is what he said. The final opposing speaker did not try any rebuttal. She projected confidently but everythjing really came down to assertion. If she avoids ever going off message she may end up as the SNP's Jo Swinson MP. When she listed education as one of the things we beat England on I raised as a point of order that our results were, for the first time in 700 years, now level with the UK average and that this was shameful. When she specifically asked for anybody who thought our economy would be worse under separation I PoI'd "Patrick Harvie". It was quite clear that we had indeed raised points the "Better Together Excluding Anybody Not In The Old Politics Club Campaign" have not thought about. What the separatists had expected would be an easy victory (& possibly what the LabCondems had too) over prepared and seasoned politicians turned into a defeat by UKIPers on a few minutes notice. The secret of Scottish politics us the SNP are not the lean mean well oiled political machine they are sometimes portrayed as. It is sinmply that the other Scottish parties are more inept and useless. And so to the pub (Counting House) where I am afraid I rather would up some of the nationalists (including 2 girls who are SNP MSPs'assistants) who had probabnly never seen somebody from UKIP before and expected me to have horns. We agreed to disagree on whether UKIP not, yet, being a mass Scottish party is because the almost all ordinary people in Scotland oppose the death penalty & I don't. They were even more non-plussedabout X-Prizes.. All good clean fun. Talking to the WOSPDS organiser he assured me it had been a good debate and that we would be welcome to provide fresh air on other subjects in future. Robert Malyn did an audio recording of the event. First newspaper in Britain to publish any letter on 28gate. Clark Cross had this in the Edinburgh Evening News last night. I WATCHED, with growing anger, the BBC News reporting on the Doha climate change conference. The BBC ran footage of icebergs and the mandatory polar bear and her two cubs. I had not realised that BBC stood for “Biased Broadcasting Corporation”. Since 2006, the BBC has claimed that its position of promoting the catastrophic global warming fraud and censoring the appearance of dissenters was justified. The justification for this was that in 2006 a meeting of the country’s 28 “best scientific experts” had unanimously told them that there was no scientific doubt that mankind was responsible for climate change. The BBC refused to say who these “28 leading scientists” were and spent licence payers’ money employing top barristers to prevent us finding out. These names were recently leaked online. So, who are Britain’s 28 “leading scientists”? None of Britain’s 100 leading scientists are among them. There is an MP, a Church of England dignitary, representatives from Greenpeace and Stop Climate Chaos, the US government, BP, those with vested commercial interests, people from the foreign “aid” industry and “environmental” activists. Such conduct would have embarrassed the Soviet Union. Honest I'm not jealous. apart from anything else it was inspired by him having seen my previosu list of letters sent out 341 times - none of which were published. I had also sent out this letter to another 55 papers in Britain and across the USA(including the EEN) saying that it would be a statistical impoosibility that they coyuld all remain unpublished by coincidence. Clark said "That is a great challenge to the "free press" but will they duck it and prove you right??" The letter was designed to be most publishable on Wednesday and Google News shows the "free presss" censored it. Case proven. Censoring the news is one thing, though incompatible with a free press . But "readers' letters" which routinely are stiffed with letters from government funded sock puppets or people clearly employed by them, are supposed to be the sole part of a paper in which readers are allowed to express their opinions. Thus censorship of this area is even more disgraceful than censoring the news. The argument over whether the Levenson proposals will interfere with a free press now seems irrelevent since we clearly don't have one. And incidentally NOBODY from any of these papers has chosen to answer the question at the end which suggests they all know the answer and it is indeed that they are simply censoring. Wednesday is one month since the news of 28gate went viral online. The BBC had for years claimed to have secured a list of 28 "leading scientists" able to give the "best scientific advice" on alleged "catastrophic global warming," "renewables" etc. which entitled them to break their Charter, and the law of the land, requiring them to be "balanced" in their coverage. The news that broke was the identities of these "28 scientist". Only 2 were actually scientists. Those 2 and most of the rest were government funded warming activists. Also among the 28 were "renewables" salespeople, many international "aid" activists and, presumably to ensure the support of higher and from the Church of England and US embassy. Departments across the BBC, even comedy, were involved. Thus almost everybody in the organisation knew that, for 6 years, the BBC have lied to justify being a propaganda organisation attempting to terrorise the entire population with a "catastrophic warming" story they knew was at least partly false, has failed for which no scientific evidence exists. Since everybody in the country is a victim, the Climate change act alone will cost Britain nearly a trillon £s, and almost everybody in BBC management must have known it is thousands of times more important than the Savile scandal. Indeed I know of nobody who disputes it. The BBC have censored any mention whatsoever of this news. The failure to report this news by other broadcasters (who are government regulated) and the rest of the press who aren't, is more remarkable. (B) have any reason, compatible with proclaimed journalistic ethics, for not reporting it? This is an interesting example, going the media rounds. Both of how the state, while eager to push false scare stories to promote more useless government spending, are unwilling to talk about real scares which a very little government action could easily solve. Also of how statistics are played with to produce and/or hide relevances which the statistics simply aren't strong enough to support. THE highest rate of multiple sclerosis in the world has been found in a small group of Scottish islands, and the number of residents developing symptoms has massively increased. Authors of the research, which is the first study of its kind for 40 years, say they cannot determine why Orcadians and those who move to the islands, which have a population of about 20,000, run such a high risk of having the disease. However, genetics expert Dr Jim Wilson, who led the investigation, believes it may be at least partly explained by an inherited genetic weakness yet to be discovered by scientists. He said: "With this clustering, some people would try to say it is due to the soil or something in the water. But, at least in the past, people married in their own community very often. At some level with their genetic background people in a parish are part of the same extended family. Even if we have not been able to find a genetic factor [to explain the dense levels of MS] it does not mean that it is not out there." The findings have been released little more than a week after figures showed a seven-fold increase in the number of Scots under the age of 30 developing MS in some health board areas. It has long been known that Scotland, and the Orkney islands in particular, have among the world's highest rates of MS along with parts of Canada and Scandinavia. However, Mr Wilson said the last comprehensive study was in 1974. It found the number of people in Orkney diagnosed with probable or definite MS was 309 per 100,000. The new research, published in the Journal of Neurology, Neurosurgery & Psychiatry, found this has now increased to 402 per 100,000, which would equate to roughly 80 people on the islands. MS has long been linked to the so-called sunshine-drug Vitamin D, but Mr Wilson said that as the Shetland Islands, further north, appeared to have less of a problem than Orkney this was unlikely to fully explain the Orkney situation. The link between MS (also rickets and to a whole range of health conditions - vitamin D, unlike the other vitamins which are trace elements, is a hormone regulating a whole range of bodiy functions) is clear & has been for years. I have discussed it previously. The best way to improve Scotland's abysmal health record would be to mandate that some staple food, I suggest salt since everybody eats a roughly similar amount of it, have vitamin D added to it when sold in Scotland. In the same way iodine was added for similar reasons many years ago - when governments wereless parasitic and able to make decision. This would cost very little & be exactly the sort of thing that a separate Scottish administration, able to deal with porely Scottish problems, was set up for. The degree to which vitamin D improves health can be seen by looking in the mirror. White skin creates more vitamin D. Up till about 50,000 years age we were all black but as humanity colonised the northern latitudes white skin became a considerable evolutionary advantage. Yet this "research" is clearly going to great lengths to downplay the D link by concluding that it can't be because Shetland is marginally to the north of Orkney. Orkney and Shetland's populations are, according to DNA, a very similar mixture of Scandanavian and old Scots. The difference between Orkney and Shetland, so played up is not going to be because of the massive genetic differences. So what is causing it - lets look at the numbers. All this so many "cases per 100,000" ignores the fact that Orkney's population is 19,500, Shetland's is 22,000. So this important difference between 295 & 402 per 100,000 is actually 21 cases.Not statistically enough to draw any real conclusions from. Random chance easily accounts for such a small numerical difference. But enough to turn an easily achieved serious improvement of the entire Scottish health scene, into something requiring far more, expensively funded, "research" and megayears of civil service manhours to do nothing about. And of course lots of lives made painful or ended unnecessarily. Labour Voters - Do Those Who Vote For A Goat Wearing A Labour Rosette Deserve Respect? Back in my days in the Libdems one of their more intelligent candidates one told me "it's no use telling a Labour voter his MP is an idiot or a crook because they already know". I was reminded of this by a couple of items. What does Labour have to do to lose a seat like Rotherham? The previous MP, Denis MacShane, resigned after obtaining public money by deceit – a far worse case of malfeasance than many which attracted heavier opprobrium during the expenses revelations. The candidate chosen to select him, Sarah Champion, was imposed by the NEC, prompting half the local party to walk out in protest. The council's inactivity over child grooming cases was juxtaposed with its unbelievable removal of foster children from UKIP-voting parents. And yet, even in a by-election, even when there was no chance of changing the government, even when they might have painlessly signalled that they were sick of being messed around by smug politicians, the townsfolk plodded out to give MacShane's party a massive majority. The latest instalment in Guido’s How Much Does David Miliband Earn? series reveals that the jet-setting former Foreign Secretary trousered an average of £15,000-a-day for his outside work last month. Miliband made £25,000 for his two-day job at Sunderland football club, £12,000 for 24-hours’ work advising Oxford Analytica and £23,000 for just one day at VantagePoint Clean Tech. He also enjoyed a £6,000 all-expenses paid trip to Washington. £60,000 for four days work. If he was competent enough to get any of these jobs on merit i wouldn't object but back when he was in office he had a ministerial blog, rumoured to have cost the taxpayer £100k to set up, onwhich he put the most thought and fact free inanities about "catastrophjic global warming" (& absolutely failed to answer anybody who commented using facts) that it is clear he has the intellectual capacity of pumpkin.